There’s appears to be a massive proliferation of consumer centered companies interested in obtaining feedback from its customers. Almost where ever I purchase something and receive a receipt, there’s an online or a mobile survey link in the receipt. For this article, I want to share my experience with a mobile survey from Kentucky Fried Chicken. I’m not sure about you, but I like Kentucky Fried Chicken – KFC. Actually, I’m pretty much a sucker for anything fried, but especially chicken. But, my love with KFC actually started back in High School, where I worked as a cashier at KFC, but then rose up the ladder to become Assistant Manager. At the time, that was a pretty big deal for me, especially since I was only a Junior in High School, working 30 hours per week while maintaining a normal High School curriculum. But, I needed the money and, in retrospect, having that type of business experience early on in my life taught me so much that I still draw from even today. Back to the mobile survey. 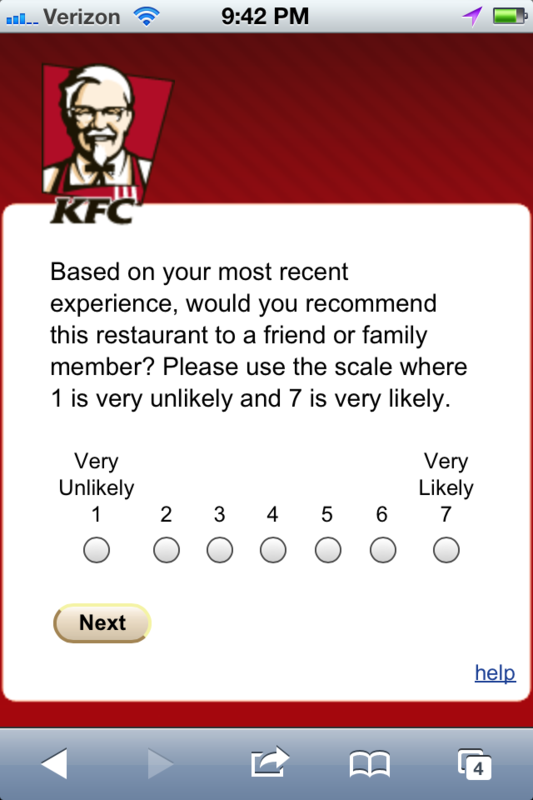 KFC chose to use a 7 point likert scale for their NPS Survey. They placed a small space between “Unlikely” and “Likely” to better discriminate between choice options. Because of the mobile aspect, they were sensitive and very wise about making the survey just one question and they made it very easy to complete. I imagine response rates for this survey are very high. It’s a beautiful design and the mobile aspect is very forward thinking. 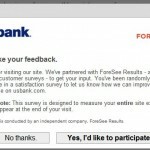 This survey only had 1 question – yes, it’s the Net Promoter Question. Of, course, I’m a Promoter. The mobile survey software is designed very nicely. Kudos to KFC – great chicken, and great mobile survey design. Good to know more are using NPS to transform the company. 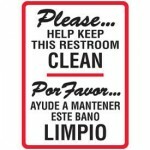 One question is obviously good for customer especially answering over the phone, but there lies a fundamental issue! 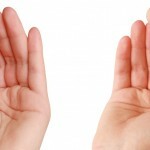 NPS is not (just) about measuring the results, but more about taking action on the results. WHile KFC can measure the NPS well, but I could not imagine how they will improve the results as there are no leads on what is driving a detractor! Satya, you beat me to it: you are precisely correct. While knowing your Net Promoter Score is fun, it is basically worthless if you don’t know how to change it. Having no “why did you give us that score” question in the survey makes the whole process interesting but useless. I liken it to seeing your car’s speedometer but not having access to the brakes or gas pedal. 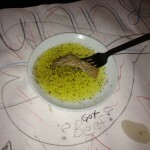 You know exactly how fast you are going but have not way to speed up. How does 1-7 scale work? 1-4 detractor, 5 passive , 6-7 promoter?